The upcoming Arabplast exhibition in Dubai will feature a record number of British Pavilion exhibitors. At least twelve different companies from across the UK will form the pavilion, and due to high demand the deadline for booking has been extended until Friday 14 September. Eligible British companies can benefit from Department for International Trade (DIT) grants of £2,500 per company. 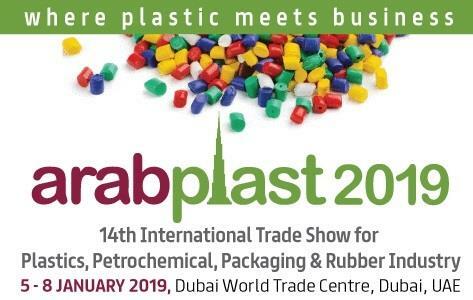 Arabplast, which takes place every two years, will be held between 5-8 January 2019. Organised by Messe Dusseldorf, it is the largest plastics and rubber exhibition in the UAE region, attracting over 27,000 visitors from 119 countries and 906 exhibitors from 41 countries in 2017. “Being part of a group gives UK exhibitors an advantage of scale and better location within the halls. It’s one of the most cost-effective ways of exploring the market first-hand as there is a lot of knowledge sharing amongst pavilion exhibitors as well as with DIT Dubai and the British Centre for Business Dubai, who meet our exhibitors in the market”. The British Pavilion will be located in Hall 6, one of the international halls that also features pavilions from Germany, Austria, Switzerland, France and more. Companies within the British Pavilion include: Beta LaserMike, Atlas Converting Equipment, Farrel Pomini, Tinius Olsen Ltd, Ecodek/ Vannplastic Ltd, Fraser Anti-Static Techniques Ltd, Ray Ran Test Equipment, LG Energy Group, Listgrove Ltd, Ministry of Waste/ Waste Challenge Ltd, Converting Nation and the British Plastics Federation.